Ideas about the benefits both of public ownership of the Theatre and of the involvement of an ETPA-like nonprofit community organization were incubating in the minds of various concerned visionaries years before the closure of the Theatre in 2005. This can be observed by going back in time to holiday preparations in December 2000 as reported in the December 5, 2000 issue of The Register-Guard,1 which is the source for this prologue. 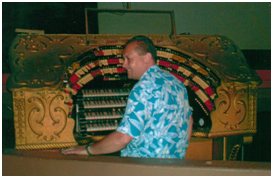 Even as Paul Quarino had been caring for the organ on his visits to Coos Bay and always had it ready for performance, prior years of neglect had taken their toll on the Mighty Wurlitzer. Mice had nibbled the cotton and wax-covered electrical wires and saltwater had seeped through the cracks in the concrete during winter high tides, occasionally flooding the orchestra pit. The Mighty Wurlitzer had fallen silent. 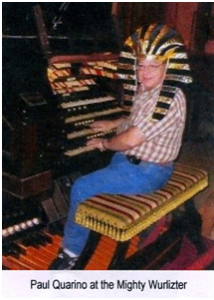 Although the Egyptian’s Annual Christmas concert organizers planned to carry on with Wilbur Jensen’s Christmas Brass Ensemble and a vocal group from Marshfield High, the organ and Littlefield would not be part of the program. 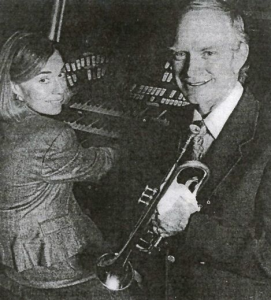 Wilbur Jensen, the Coos Bay dentist leading the brass ensemble, said his “dream of dreams would be for the city to acquire the building as a performing arts center.” City Manager Bill Grile said the idea had merit, but balked at the price. Photo to the right is of Lee Littlefield and Dr. Wilbur Jensen. Fast forward to late 2005 when, on November 27, the theater showed what could have been its last movie, thus “bringing to a close eight decades of providing a house of entertainment for South Coast residents”.2 The owner at the time, Coming Attractions, had decided to close the Theatre and put the building up for sale. “The theater is silent and the lights are off, but on the marquee is a sign indicating the historic Egyptian Theatre is for sale. A group from the Little Theatre on the Bay and other concerned people will hold a march Saturday morning before the Christmas performance. The revolutionary fervor is less after the group found out that the city of Coos Bay is equally concerned over the building’s fate” 3 World photo by Lou Sennick. Out of this volatile combination of events the ETPA was born, and nurtured by Theatre enthusiasts both local and from across state boundaries who believed that the Theatre was too valuable to lose. Wasting no time, the ETPA-to-be first met as “Save the Egyptian” on December 31, 2005 and began formulating plans, which were to prove successful, to do just that. 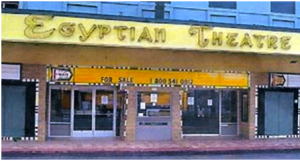 On March 16, 2006, the organization incorporated as the Egyptian Theatre Preservation Association, and David Engholm served as its first President. On October 27, 2006 the ETPA began showing scheduled movies to the general public. As stipulated by the purchase agreement between the City of Coos Bay and the former owner, Coming Attractions Theatres, Inc., the ETPA was and continues to be limited to showing movies that are five years old or older. The ETPA showed movies of all sorts including classic, art, and educational movies. On August 8, 2007 the ETPA was granted tax-exempt status as a 501c(3) organization by the Internal Revenue Service. This exempt status was deemed to be retroactive back to the original date of incorporation on March 16, 2006. In December 2007, the mini theaters installed upstairs were removed and the Egyptian Theatre balcony was once again opened to the public for the 2007 annual Christmas Concert featuring the Mighty Wurlitzer and Wilbur Jensen’s Christmas Brass Ensemble. 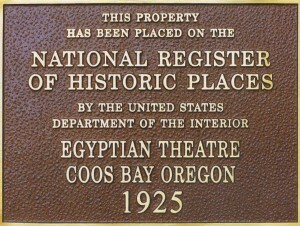 On May 24, 2010 the Theatre was listed on the National Register of Historic Places. During this five year time-span the ETPA hosted concerts, fundraisers, meetings, special events, community celebrations, and free offerings, including the annual free Christmas concert that has been offered since the 1970’s. 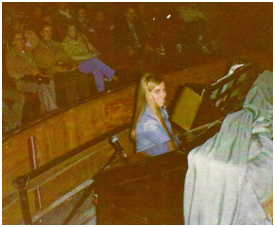 Additionally, there was ongoing extensive interior cleanup, the roof was repaired, there was refurbishment of the concession area, the main floor auditorium, and the mezzanine restrooms with new toilets. The electrical system was reworked and equipment was added to the main projection booth. Lighting fixtures were repaired, replaced and restored, the stage curtain was replaced, and the marquee signage was upgraded. 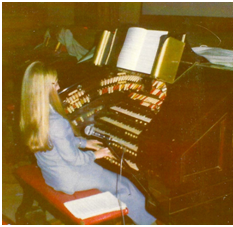 The heating system was replaced with the financial support of the Coquille Tribal Community Fund, flood concerns under the stage were mitigated, and the restoration of the Wurlitzer Theatre Organ was initiated. In 2010 the City retained an engineering firm to help the ETPA identify, estimate and prioritize Theatre restoration activities. Unfortunately, the engineers discovered that the back wall of the Theatre had been sinking, and that the Egyptian needed significant structural repairs to ensure that it was safe for our patrons. In early 2011, having just received the engineer’s report, the City decided that the Theatre must be closed until needed structural repairs could be completed. Over the course of 2011, the City and ETPA studied what needed to be done, and devised a plan to raise the funds required to implement the structural modifications needed. The ETPA reorganized itself to focus on the task at hand and, with the City’s help, retained key experts to assist in the process. These included George Kramer, noted Preservationist and past chair of the Oregon Preservation Commission; Herb Stratford, owner of Historic Theatre Consultants, with a long history of operating historic theatres, and serving on the Board of the League of Historic American Theatres; and Rich Foster, Principal of Cascadia Consulting Partnership, who designed the ETPA’s capital campaign and assisted in developing and implementing our grant funding strategies. Over the course of the next year and a half the ETPA successfully raised over $1,000,000 which was $250,000 more than absolutely needed to implement the required structural repairs. In June 2014 the Theatre re-opened with structural issues fully addressed, new roofing and drainage systems, enhanced electrical service to the Theatre, main floor ADA compliant restrooms installed, Broadway facade restoration well underway, and the hire of an experienced Executive Director/Theatre Manager, Kara Long, to take the Egyptian Theatre to the next level … a truly vibrant entertainment complex operated for the benefit of the greater Coos Bay Area community. 1 Bacon,Larry Silent pipes for Christmas concert, The Register-Guard Eugene, Oregon December 5, 2000. 2 Mickelson, Carl and Winchell, Hallie, Staff Writers, Raising awareness about Egyptian’s fate, The World Coos Bay, Oregon December 8, 2005. 5 Meet Your Board Members featuring Susan Watson, The Egyptian Preservation Association Newsletter, Coos Bay, Oregon April – May 2012. 7 Youst, Lionel Nostalgia notwithstanding, there is benefit to preserving community history, Editorial, The World Coos Bay, Oregon February 19, 2006. 8 Littlefield, Lee May 22, 2014. 9 Littlefield, Lee May 22, 2014. 10 Littlefield, Lee Meet Your Board Members featuring Paul Quarino, The Egyptian Preservation Association Newsletter, Coos Bay, Oregon April – May 2012.